Pastors and their families live under incredible pressures. Their lives are played out in a fishbowl, with the entire congregation and community watching their every move. They are expected to have ideal families, to be perfect people, to always be available, to never be down and to have all the answers we need to keep our own lives stable and moving forward. Those are unrealistic expectations to place on anyone, yet most of us are disappointed when a pastor becomes overwhelmed, seems depressed, lets us down or completely burns out. That's why God has instructed us to recognize His servants. "The elders who direct the affairs of the church well are worthy of double honor, especially those whose work is preaching and teaching" (1 Timothy 5:17). The good news is that we can make a difference! Clergy Appreciation Month is one way we can counter the negative erosion in the lives of our spiritual leaders with the positive affirmation they need. 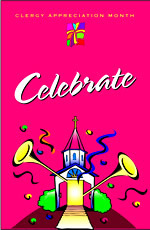 Our Clergy Appreciation Month Planning Guide is available online with complete step by step instructions and pages of exciting celebration suggestions. It also includes long-term ideas for the proper care of your pastors and their families. This complimentary guide can be reviewed, downloaded or printed immediately. CAM promotional artwork is available for use in fliers, bulletins and other promotional material. An audio greeting from H.B. London Jr. to your congregation and pastoral team can be reviewed, downloaded and copied to a CD that can be played during a time of celebration. A brief history of the concept and implementation of Clergy Appreciation Month is available by clicking here. Don't your pastors and their families deserve this kind of recognition? Do something about it today! Did your church honor its pastoral staff and their families? If so, click here to share the details and the impact it made on the pastor's family and your congregation.